This article is about the NASA SL-4 mission. For the NASA SLM-4 mission, see Skylab 5. For the Rogério Skylab album, see Skylab IV. It has been suggested that this article be merged with Skylab controversy. (Discuss) Proposed since October 2018. Skylab 4 (also SL-4 and SLM-3) was the third manned Skylab mission and placed the third and final crew aboard the first American space station. The manned Skylab missions were officially designated Skylab 2, 3, and 4. Mis-communication about the numbering resulted in the mission emblems reading Skylab I, Skylab II, and Skylab 3 respectively. Cape Kennedy was named Cape Canaveral officially on October 9, 1973. The name restoration to Cape Canaveral became official on October 9, 1973.The first manned launch under the name of "Cape Canaveral" was the Skylab 4 mission, on November 16, 1973. With three rookies, Skylab 4 was the largest all-rookie crew launched by NASA. Following the all rookie Mercury program, there were only five more all-rookie NASA flights -- Gemini 4, Gemini 7, Gemini 8, Skylab 4 and, in 1981, STS-2. 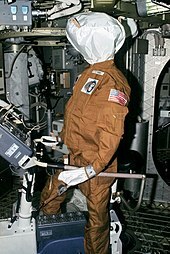 One of the dummies left behind by the Skylab 3 crew to be found by the Skylab 4 crew. False color image of Comet Kohoutek photographed with the far-ultraviolet electrographic camera during a Skylab spacewalk on December 25, 1973. The all-rookie astronaut crew arrived aboard Skylab to find that they had company – three figures dressed in flight suits. Upon closer inspection, they found their companions were three dummies, complete with Skylab 4 mission emblems and name tags which had been left there by Al Bean, Jack Lousma, and Owen Garriott at the end of Skylab 3. Things got off to a bad start after the crew attempted to hide Pogue's early space sickness from flight surgeons, a fact discovered by mission controllers after downloading onboard voice recordings. Astronaut office chief Alan B. Shepard reprimanded them for this omission, saying they "had made a fairly serious error in judgement." The crew had problems adjusting to the same workload level as their predecessors when activating the workshop. The crew's initial task of unloading and stowing the thousands of items needed for their lengthy mission also proved to be overwhelming. The schedule for the activation sequence dictated lengthy work periods with a large variety of tasks to be performed, and the crew soon found themselves tired and behind schedule. Seven days into their mission, a problem developed in the Skylab gyroscopic attitude control system, which threatened to bring an early end to the mission. Skylab depended upon three large gyroscopes, sized so that any two of them could provide sufficient control and maneuver Skylab as desired. The third acted as a backup in the event of failure of one of the others. The gyroscope failure was attributed to insufficient lubrication. Later in the mission, a second gyroscope showed similar problems, but special temperature control and load reduction procedures kept the second one operating, and no further problems occurred. On Thanksgiving Day, Gibson and Pogue accomplished a 6½ hour spacewalk. The first part of their spacewalk was spent deploying experiments and replacing film in the solar observatory. The remainder of the time was used to repair a malfunctioning antenna. During the experience, Gibson remarked, "Boy if this isn't the great outdoors! Inside, you're just looking out through a window. Here, you're right in it." The crew reported that the food was good, but slightly bland. The quantity and type of food consumed was rigidly controlled because of their strict diet. Although the crew would have preferred to use more condiments to enhance the taste of the food, and the amount of salt they could use was restricted for medical purposes, by the third mission the NASA kitchen had increased the availability of condiments, and salt and pepper was in liquid solutions (granular salt and pepper brought aboard by the second crew was little more than "air pollution"). On December 13, the crew sighted Comet Kohoutek and trained the solar observatory and hand-held cameras on it. They gathered spectra on it using the Far Ultraviolet Camera/Spectrograph. They continued to photograph it as it approached the Sun. On December 30, as it swept out from behind the Sun, Carr and Gibson spotted it as they were performing a spacewalk. As Skylab work progressed, the astronauts complained of being pushed too hard, and ground controllers complained they weren't getting enough work done. NASA determined major contributing factors were a large number of new tasks added shortly before launch with little or no training, and searches for equipment out of place on the station. There was a radio conference to air frustrations which led to the workload schedule being modified, and by the end of their mission the crew had completed even more work than originally planned. 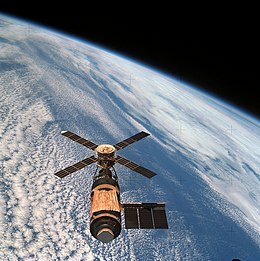 Apart from the controversies, Skylab 4 was noted for several important science contributions. The crew spent many hours studying the Earth. Carr and Pogue alternately manned controls, operating the sensing devices which measured and photographed selected features on the Earth's surface. Gibson and the other crew made solar observations, recording about 75,000 new telescopic images of the Sun. Images were taken in the X-ray, ultraviolet, and visible portions of the spectrum. The crew also photographed the Earth from orbit. Despite instructions not to do so, the crew (perhaps inadvertently) photographed Area 51, causing a minor dispute between various government agencies as to whether the photographs showing this secret facility should be released. In the end, the picture was published along with all others in NASA's Skylab image archive, but remained unnoticed for years. The Skylab 4 astronauts completed 1,214 Earth orbits and four EVAs totaling 22 hours, 13 minutes. They traveled 34.5 million miles (55,500,000 km) in 84 days, 1 hour and 16 minutes in space. Skylab 4 was the last Skylab mission, the station fell from orbit in 1979. The three astronauts had joined NASA in the mid-1960s, during the Apollo program, with Pogue and Carr becoming part of the likely crew for the cancelled Apollo 19. 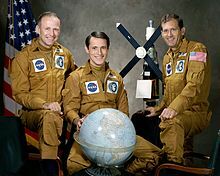 Ultimately none of the crew of Skylab 4 flew in space again, as none of the three had been selected for Apollo-Soyuz and all of them retired from NASA before the first Space Shuttle launch. Gibson, who had trained as a scientist-astronaut, resigned from NASA in December 1974 to do research on Skylab solar physics data, as a senior staff scientist with the Aerospace Corp. of Los Angeles, California. Commander Gerald Carr flies a Manned Maneuvering Unit prototype. Carr "balances" Bill Pogue as a demonstration of zero-G.
Ed Gibson floats out of the Multiple Docking Adapter connecting the station to the crew's Command Module. Carr and Gibson look through the length of the station from the trash airlock. Carr floats with limbs outstretched to show the effects of zero-G. The Pogue Seiko, a 'Seiko Automatic-Chronograph' Cal. 6139, the first automatic chronograph in space, used by Bill Pogue. Gibson at the controls of the Apollo Telescope Mount. The Skylab 4 command module on display at the National Air and Space Museum. The Skylab 4 command module is in the collection of the National Air and Space Museum in Washington, D.C, and was transferred to the museum in 1975. This module is the Command and Service Modules CSM-118 and it spent 84 days in Earth orbit as part of the Skylab mission. As of 2018 it is not on display and is either in loan or in storage. The module rolled upside down after splashdown, which happened in about half the Apollo CSM splashdowns; in this situation spheres were inflated on top of the CSM to right the module. The windows of the Skylab 3 & 4 spacecraft modules were studied for micrometeroid impacts. The module was painted white on half its side to help with spacecraft thermal management. Whereas Block II Apollo CSM had Kapton coated with aluminum and silicon monoxide, later Skylab modules had white paint for the sunward side. "The symbols in the patch refer to the three major areas of investigation in the mission. The tree represents man's natural environment and refers to the objective of advancing the study of earth resources. The hydrogen atom, as the basic building block of the universe, represents man's exploration of the physical world, his application of knowledge, and his development of technology. 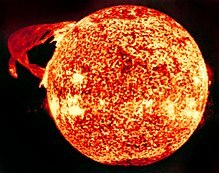 Since the sun is composed primarily of hydrogen, the hydrogen symbol also refers to the Solar Physics mission objectives. The human silhouette represents mankind and the human capacity to direct technology with a wisdom tempered by his regard for his natural environment. It also relates to the Skylab medical studies of man himself. The rainbow, adopted from the Biblical story of the Flood, symbolizes the promise that is offered to man. It embraces man and extends to the tree and hydrogen atom, emphasizing man's pivotal role in the conciliation of technology with nature by a humanistic application of our scientific knowledge." Some versions of the patch included a comet in the top curve because of studies made of the comet Kohoutek. ^ a b Lethbridge, Clifford J. Spaceline.org "Cape History". Spaceline.org. Retrieved on March 23, 2011. ^ "Photo-sl3-113-1587". spaceflight.nasa.gov. Retrieved May 21, 2015. ^ Wilford, John Noble (November 18, 1973). "Skylab Astronauts Are Reprimanded In 1st Day Aboard". New York Times. Retrieved July 11, 2018. ^ "Astronauts Try to Make Up Time". New York Times. Associated Press. November 19, 1973. Retrieved July 11, 2018. ^ "A Skylab Gyroscope Fails, Leaving Only 2 for Control". New York Times. Associated Press. November 24, 1973. Retrieved July 11, 2018. ^ "Gyro on Skylab Is Erratic; Officials Are Not Alarmed". New York Times. Associated Press. December 8, 1973. Retrieved July 11, 2018. ^ "Skylab Gyroscope Falters, Puzzling Ground Engineers". New York Times. United Press International. January 4, 1974. Retrieved July 11, 2018. ^ "Two Astronauts fix Skylab Antenna". New York Times. Associated Press. November 23, 1973. Retrieved July 11, 2018. ^ "SP-404 Skylab's Astronomy and Space Sciences". Archived from the original on November 13, 2004. Retrieved May 14, 2013. ^ "Lethargy of Skylab 3 Crew Is Studied". Reuters. December 12, 1973. Retrieved July 11, 2018. ^ "Skylab Crew Takes Day Off for Rest". New York Times. Associated Press. November 25, 1973. Retrieved July 11, 2018. ^ "Astronauts Debate Work Schedules With Controllers". New York Times. Associated Press. December 31, 1973. Retrieved July 11, 2018. ^ William Pogue's Seiko 6139 Watch Flown on Board the Skylab 4 Mission, from his Personal Collection... The First Automatic Chronograph to be Worn in Space. ^ The “Colonel Pogue” Seiko 6139, dreamchrono.com. ^ "Command Module, Skylab 4". National Air and Space Museum. March 20, 2016. Retrieved December 23, 2018. ^ "NASA - Upside-Down Astronauts". www.nasa.gov. Retrieved December 23, 2018. ^ "1979LPSC...10.1665C Page 1665". adsabs.harvard.edu. Retrieved December 23, 2018. ^ "Making The Command Module's Heat Shield". Spaceflight Blunders & Greatness. March 4, 2017. Retrieved December 23, 2018. Gilles Clement, Fundamentals of Space Medicine, Microcosm Press, 2003. pp. 212. Wikimedia Commons has media related to Skylab 4. Voices of Oklahoma interview with William Pogue. First person interview conducted with William Pogue on August 8, 2012. Original audio and transcript archived with Voices of Oklahoma oral history project.